Foundation Analysis: How Can Design of Strip Footing be Simplified? We have already have idea about modulus of subgrade reaction and evaluation factor foundation stiffness. This terms are important in this post. Now we will go to the right point. How is flexible footing designed? In this post we have only idea about this design procedure. Here our concern is how we can simplify this procedure from its complex form. 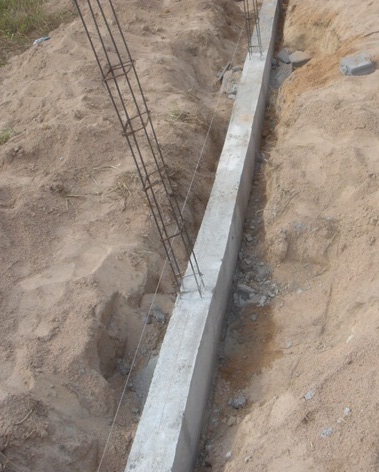 The method a foundation designer is used is “beam on elastic footing” method. The solution may either from a raft or isolated footing. It is impractical to use shear reinforcement in foundation design and the design thickness is derived from allowable punching shear or wide beam shear. As a solution method either computer methods or closed-form method of solution provided by Hetenyi(1946) is adopted. c. Minimum contact pressure developed at center of each bay. 4. This condition involves evaluation factor foundation stiffness, λ. A limitation of 1.75/ λ to 3.5/ λ have to establish while checking average of the adjacent spans i.e. we have to establish such adjacent span that satisfy the above limit.